Brushing through the heavy crowd and an insanely long queue I finally made my way inside the Lumbini Park. Nostalgia rushed in from all possible directions. Last I was here it was late 2012, God I feel old already. While I made my way ahead I could see all signs of sunset vanishing away. All my plans of capturing the lake with the backdrop of setting sun went down the drain. But fret not, good things are in store, thinking all these positive thoughts I reached the ticket counter for the boat. 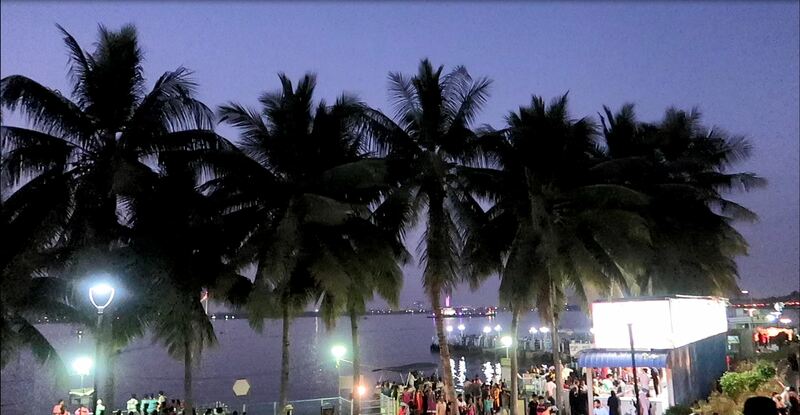 Hussain Sagar is located far away (approximately 20 kms) from the metropolitan part of Hyderabad, yet it bustles with locals every day. The sole reason for such a consistent craze for this place is the statue of Gautam Buddha in the middle of the lake. Hussain Sagar is an artificial lake and is majorly fed by canals from Musi River. The lake was considered to be the main source of water until Himayat Sagar and Osman Sagar were built on river Musi. 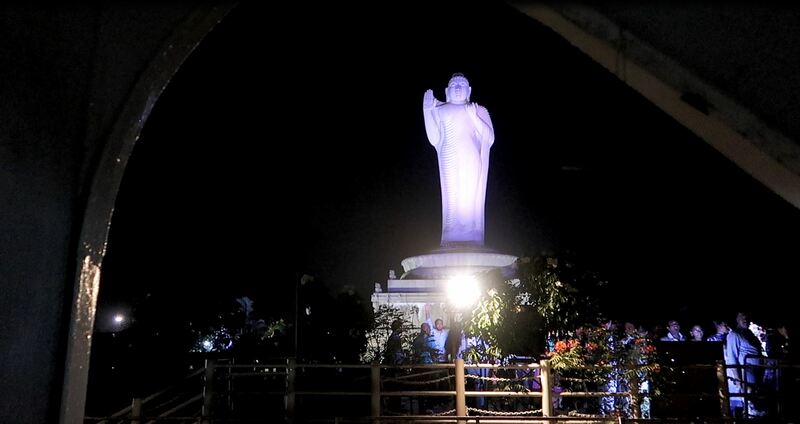 Hussain Sagar and the intriguing Buddha statue comes with an even more intriguing history. It took vision, hard work, consistency and even human lives for the successful erection of the statue. The major credit for this installation goes to N.T. Rama Rao who was the Chief Minister of Andhra Pradesh between 1983 and 1989. As already spilled N.T.Rama Rao is the major force behind the erection of the statue. But it all started during his visit to New York. He was mighty impressed with the statue of Liberty and the efforts put in the statue’s restoration left him inspired. He came back to India with the thought of doing something similar in his own country. After much cogitation N.T Rama Rao decided on building a statue of Gautam Buddha. The decision majorly based on the fact that Gautam Buddha was a humanitarian and always taught the way of life to people. After spending a long time into catering various logistical issues, the work on Buddha statue was finally inaugurated by N.T.Rama Rao in 1985. It took almost 200 sculptors, five years and 3 million US dollars to create the 58 feet tall Buddha statue. Now the next task was to build a base in the lake to install the statue. A 15 feet high concrete platform also known as “Rock of Gibraltar” was constructed in the middle of the lake. The platform was ready and so was the statue, the next big task in line was the installation of the statue. In the year 1990 (N.T.Rama Rao’s tenure was over), a local transportation company was hired to transfer the statue to the platform. During the transportation the statue tripped and fell off in the lake. Ten people were killed in this hapless incident. After a salvage operation which ran for 2 years the 450 ton Buddha Statue was pulled out of the lake. The same statue which took lives was now being resurrected but in no way those lives could come back. The statue was successfully installed on the platform on 1rst December 1992. Later in 2006, the Dalai Lama performed a ritual and consecrated the statue. Since then this Buddha statue has only seen faces amazed in wonder and gain accolades in abundance. While the humungous Buddha statue is inundated with accolades, Hussain Sagar Lake is also not behind. On 27th September 2012, on the occasion of World Tourism Day Hussain Sagar lake was declared as the “Heart of the World” by The World Tourism Organization (UNWTO). The reason behind this declaration is the fact that out of all the heart shape marks formed by heart shaped lakes and islands that exist in the world, Hussain Sagar Lake is the only one which is World’s Largest Heart Shaped Mark, the World’s Heritage Heart shaped Mark, and the World’s Wonderful Heart Shaped Mark. Isn’t that amusing that a lake which you pass by every day and possibly don’t give a single though to holds so many titles. The last time I took the speed boat so this time I decided to opt for a mechanized boat. By the time I hopped in the necklace road was glittering with the street lights. 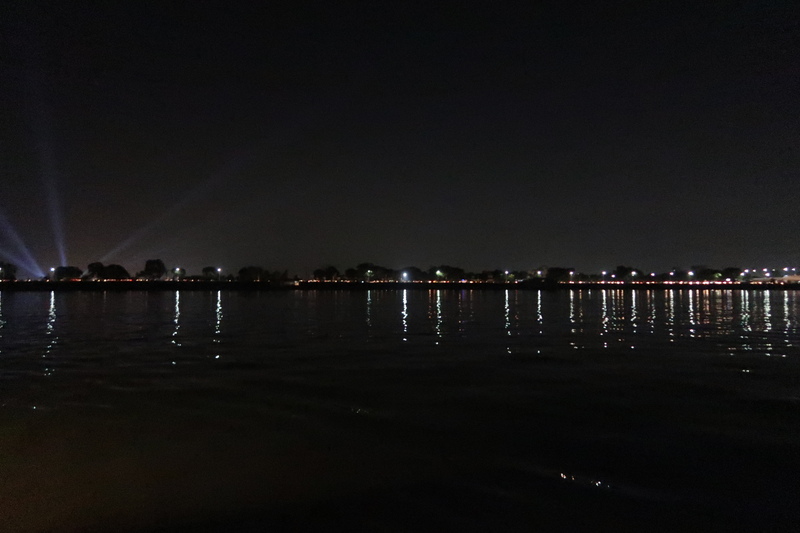 As the boat kept moving away from the banks the lights started diminishing in size. A huge National Flag fluttering with high speed of wind and I had goosebumps already. A few minutes sailing in the water and the huge statue started coming closer to the sight. It is gigantic and with its first sight it blocks your vision. I doubt if you will be able to look anywhere else. I stepped off the boat with my eyes on the statue. Skipping all the instant photograph offers I made my way in. It’s beautiful beyond words and after the sun goes down the statue is illuminated with various neon color lights. The color keeps switching every few seconds. I took a round around the platform on which the statue is installed. I observed that there are many carvings on the platform. To me they all were depicting the life lessons from Gautam Buddha. After a while I sat on the ground in front of the statue and watched it change colors of lights. There is nothing much that you can do there except getting awed by the imposing statue. Soon it was time to head back and I bid adieu to the enlightened statue. 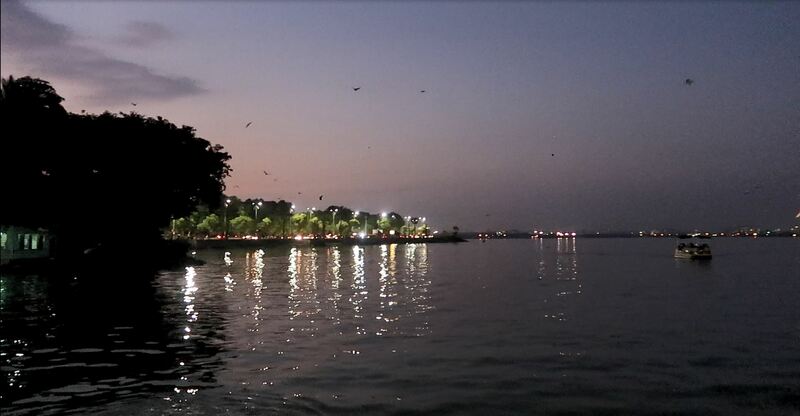 Hussain Sagar is located pretty far (approximately 20-25 kms) from the main Hyderabad city. 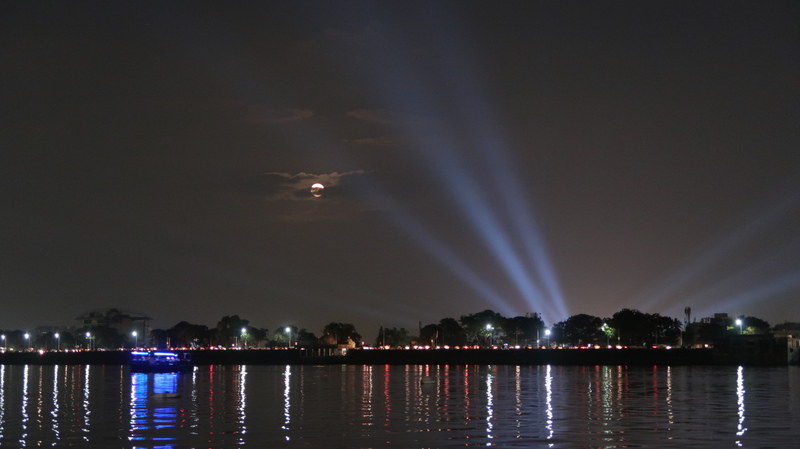 If you wish to drive down set your Google maps to either Hussain Sagar or Lumbini Park. You can easily park your vehicle at Lumbini Park and walk till the ticket counter of the park. You need to first take a ticket to get into the park. And later another ticket for the boat to the statue. The boat takes around 15 minutes to reach the statue. Also, also I made a short video about Hssain Sagar as well, maybe check that out too. The photographs are copywriters property. Reproduction of any of the contents, including the photographs without prior consent/permission of the writer will attract legal action. Thank you for sharing these facts. Nice 🙂 Thanks for sharing !! The photos are amazing ! I always wanted to visit the place during evening or early morning. Havent happened yet. Loved the post. Kidding, you should go there, its very serene. This article important and really good the for me is.your info is quite helpful to forever. Thanks!